for us that means the tree is up, the daily watching of Christmas films has commenced and that I have decided it is acceptable to eat mince pies at any time of the day. we don't have a huge amount of presents to buy as although we come from big families we tend to buy mostly for the children (otherwise it would be a serious task! ), and obviously our parents and friends. Joe and I tend not to buy big presents for each other as generally Christmas is an expensive time anyway but we do usually buy each other some sort of snuggly Christmas pyjamas- that are getting more ridiculous as the years go by! it really does make you feel like you're getting to experience the magic all over again but in a completely different way. Obviously this is also our first Christmas as a family of four so it is already feeling very special. 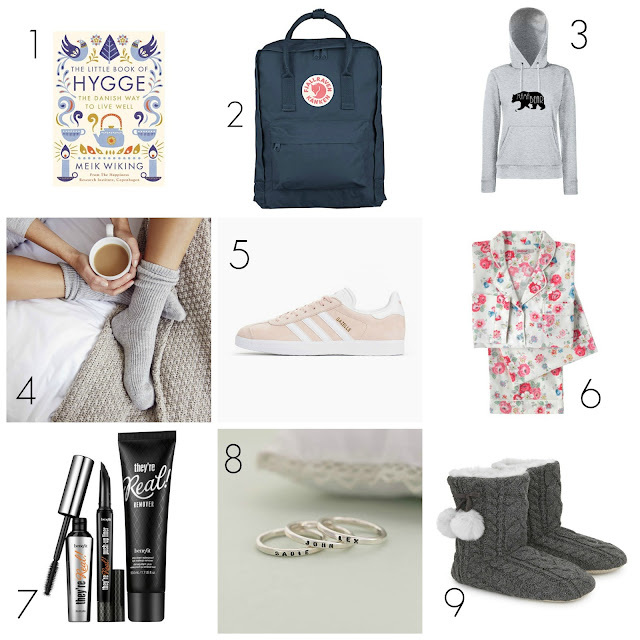 Although I'm not expecting Santa to pay me a visit I thought it might be fun to put together my own wishlist while I'm enjoying a bit of peace this evening! 1. I've heard so much about "Hygge" through instagram over the last few months so I had a little read of this when I was in Waterstones last week and thought it was such a lovely concept. I'm all about creating cosiness so it's right up my street! 2. You rarely travel light with two little ones in tow so I'm always on the lookout for the perfect carry-all; I've wanted one of these Kanken bags ever since I saw them last year; I love the smart design and every colour they come in is gorgeous- apparently they were designed to be super light too which is an added bonus! 3. I came across these Mama Bear Sweatshirts on Instagram and thought they were so cute; And they have matching Papa bear and Bear cub ones too! 4. I've recently discovered cashmere and how ridiculously warm it is. The only problem of course is that it's rather expensive so mine tends to be secondhand if I can spot a bargain here or there. These would be a serious treat! 5. I've wanted a pair of Adidas originals since my tomboy days as a teenager- but these are my favourite colour too. Swoon. 6. It's no secret that I love my Pj's - My favourites are brushed cotton and traditional styles- Cath Kidstons designs are just perfect. 7. I am a huge fan of Benefit cosmetics; I've been using Benetint for years and recently switched to their Oxygen foundation which is just perfect. I need everything of theirs especially the mascara/brow collection but I'll have to build up my collection slowly! 8. I don't wear lots of jewellery usually but I do love nice rings and stacking ones have become my favourite in the last year, I love these silver stacking rings and how they can be stamped with your loved ones names. Simple but beautiful. 9. Super Cosy Slippers. And of course they must be able to accommodate fluffy socks. Well that's my Christmas wishlist- I think I should probably get on now with the actual Christmas shopping or at least some ironing! What's on your wishlist this year?